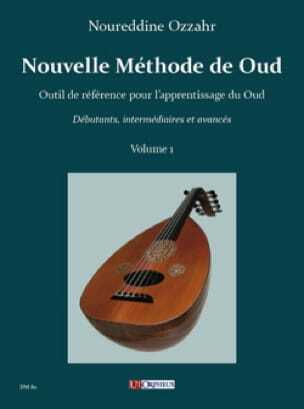 The work of Noureddine Ozzahr New Method of oud was born at the end of a questioning on the reasons which make that the methods of learning of our instrument-king, do not arrive at the level of the methods conceived for the piano, the violin , the guitar and other Western instruments. Winner of the Conservatory of Music of Casablanca, the author received a training characterized by a great rigor, lavished by the late professor Abderrahim Zarhoun who played a determining role in the improvement of the teaching techniques of oud in Morocco, s' thus inscribing in this great movement inaugurated in Iraq in the first half of the last century by Cherif Mouhieddeine Haïdar and his successors Jamil Bashir, Jamil Ghanim, Mounir Bashir, Salman Choukr, etc., who revolutionized the teaching of the oud and knew how to do so to go beyond its role as a simple partner in traditional orchestras to make it a concert instrument par excellence. The author's major innovation compared to traditional methods lies in his emphasis on the study of plectrum richa playing techniques and the introduction of unpublished "pincé" and "buté" concepts into a method designed for the oud. Having long rejected the beginners and the more advanced handicapped, the good handling of the plectrum is a necessary passage towards a true mastery of the oud. It is here described methodically and exhaustively for all cases requiring a particular posture for the attack of the strings. For each of these combinations it is indicated, by means of graphic illustrations, examples and exercises, the direction and the angle of attack as well as the nature of the nip making it possible respectively to optimize the movements of the right hand and to print with its generated the intensity and timbre demanded by the musical score. It is a high-quality didactic book designed from the outset for teachers who will find an indispensable tool to transmit to the lovers of this beautiful instrument a method worthy of the name both innovative and unpublished allowing them to satisfy their thirst for knowledge and mastery of the oud, in the safest, most complete way and by means of abundant exercises that the author has carefully elaborated in a most pleasant melodic style. Noureddine Ozzahr is a professor of oud, guitar and musical training at Salmon Music School (Partner for Morocco of Alfred Cortot, Ecole Normale de Musique de Paris). He also teaches oud and Maqâmat Arab at the Conservatory of Music of the City of Casablanca.